KELT is a photometric survey for transiting exoplanets. We take images (photometry) of tens of thousands of stars every night in an attempt to see planets outside our Solar System pass in front of (transit) the star that they are orbiting. Since the late 1980s, astronomers have discovered thousands of planets orbiting other stars - in the same way that the eight planets of our Solar System orbit the Sun. Some of these planets are what are known as “hot Jupiters.” These planets are as big as Jupiter, the largest planet in our Solar System, but orbit their parent star much closer than our Jupiter does: typically taking anywhere from 2 to 10 days to complete an orbit, instead of the 12 years Jupiter takes to go around the Sun. These hot Jupiters can sometimes pass in front of, or transit, their star from our perspective on Earth. 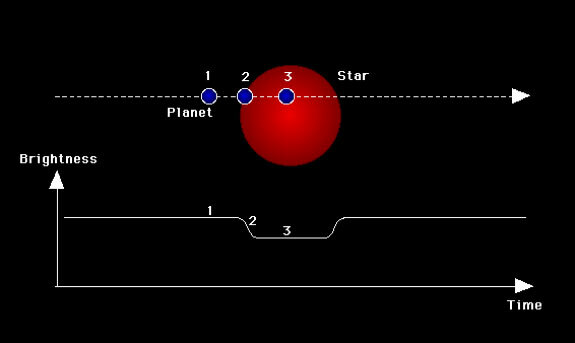 The diagram above shows what typically happens when a planet the size of Jupiter passes in front of its parent star. From Earth, it appears as though the star gets slightly dimmer for the several hours it takes the planet to cross in front of the star. For a hot Jupiter, the planet will block about 1% of the light from the star. The goal of a photometric transit survey like KELT is to identify these planets by looking for this tell-tale 1% dimming. Since there is only a 1 out of 10 chance that a hot Jupiter will transit its star, and since not every star is orbited by a hot Jupiter, KELT needs to look at tens of thousands of stars over the course of several years to find transiting planets. Both KELT telescopes are fully robotic. Every night, each KELT telescope checks if the weather is good, and if it is starts observing a list of fields around the sky, one after another through the whole night. In each field, there are between 50,000 and 200,000 stars that KELT can measure the brightness of. The various KELT fields are displayed below. This is a busy map; here is a larger version if you prefer. In this figure, the KELT fields are indicated by yellow squares. The blue patches are where the TESS mission will be observing stars, so the KELT-TESS overlap is in green. In addition, we see the Kepler and K2 fields outlines in blue, a model of the galactic plane in magenta, and a number of the KELT planet discoveries also labeled. Our typical target stars have apparent visual magnitudes of 8 to 11. This means that these stars are 20 to 100 times fainter than can be seen with the naked eye. But in comparison, most other transit surveys look for planets around stars 100 to 500 times fainter than the naked eye limit. KELT is able to effectively survey brighter stars because we have a much wider field of view and a smaller telescopic aperture than other surveys. Planets transiting brighter stars are very scientifically valuable, because these are the systems that are the easiest to measure with large ground- and space-based telescopes. Once we have identified a star which shows a dip in brightness, there still remains a great deal of follow-up work. Through a twist of physics, hot Jupiters are the same size (though not the same mass) as the smallest stars. This means that a small star orbiting and passing in front of a larger star will cause the same dip in brightness as a transiting hot Jupiter in the KELT data. In fact, because small stars are orbiting other stars are more common than hot Jupiters, most of the signals that KELT identifies are in fact double star systems. We separate the hot Jupiters from the double star systems with the help of our follow-up collaborators. Located all over the world, our follow-up team takes high-quality imaging and spectroscopic observations of our best planet candidates. By looking for flat-bottomed achromatic transits and small amplitude radial velocity orbits in these data, we are able to pick out which stars host actual planets. An exoplanet (also called an extra-solar planet) is a planet orbiting a star outside of our solar system. So far, about 3700 exoplanets have been discovered using various methods. What is a transiting exoplanet? In some cases, an exoplanet's orbit around its host star happens to be aligned with our line of sight from Earth. In those cases, when the exoplanet passes in front of its parent star during its orbit, it blocks a small fraction of the star’s light, and we see a drop in the brightness of the star. That drop in brightness happens once each time the planet orbits. The larger the planet is, the deeper the drop in the brightness of the star will be. What is so special about transiting exoplanets? There are also other methods to discover exoplanets such as direct imaging, radial velocity and microlensing. The transit method is special because it can provide a precise measurement of the size of the exoplanet. Also, if a planet is found to be transiting, it can be later observed with larger telescopes to measure its atmosphere. We eventually want to know if there is life any where else in the universe, and looking for habitable planets orbiting other stars is one way to investigate that. We also want to learn how all kinds of planets are formed, and how they change over time. We are therefore trying to find as many exoplanets as we can, of all different types, to learn about the variety and diversity of exoplanets. The Kilodegree Extremely Little Telescope (or KELT) consists of two telescopes in the North and South hemispheres and its primary mission is to look for transiting exoplanets around bright stars. KELT-North is located at Winer observatory in southeastern Arizona, and KELT-South is located at South African Astronomical Observatory in South Africa. There are many people involved in KELT, but primarily, it is run by a collaboration of astronomers from Ohio State University, Vanderbilt University, and Lehigh University. How long has KELT been running? KELT-North was installed at Winer observatory in 2004, and started operating in 2006, and KELT-South was deployed at Sutherland in 2009 and began operating the same year. Each KELT telescope takes images of the sky automatically every night if the weather is good. The data is then transferred online to Ohio State and Vanderbilt for analysis and storage. How many planets has KELT discovered so far? As of August 2018, KELT has discovered 21 extra-solar planets. Among the planets discovered by KELT is the hottest planet ever discovered, KELT-9b. What are the common features of KELT exoplanets? All of the KELT planets are hot gas giants that are in a very close orbit around their parent star. The masses of these planets range from 0.2 to 27 times the mass of Jupiter, with orbital periods between 0.9 and 8 days. For more details about physical properties of these planetary systems please see here. Are any of the KELT planets a potential candidate for having life? All of the KELT planets are very hot gas giants orbiting close to their parent stars. They would be very hostile to life and would be unlikely to be habitable. We are not searching for these planets to directly find life. Rather, we are trying to better understand how planets form and evolve, and develop techniques that can later be use to search for life on other planets.